The other day, I finally broke down and bought a wireless aircard from Sprint. The problem is: I couldn’t get it working on OS X, even after calling tech support! Yes, I have access to T-Mobile hotspots. Yes, there is a Starbuck’s on every corner. But sometimes I need access from random places. The moments when I find myself in a situation where Internet is not readily available are rare. But when I need to get online, and I’m on a meeting with a small business in the middle of nowhere, $60 per month is chump change considering that could mean the difference between my landing the account or heading back home passing the time with Facebook Word Challenge. Although I’m not fond of their cellular plans, I decided to go with Sprint, since I’m confident that they’ll have the broadest coverage in the areas where I’ll likely be. Installing the software for these devices is seemingly straight-forward. But, contrary to what the instruction booklet tells you, their software does NOT immediately work with OS X. This is something I discovered after trying it, and later calling tech support. These instructions were written for OS X 10.5 (Leopard), but you should be able to figure out the configuration settings on previous OSes based on these. When you insert the broadband card into the USB port on your mac, the TRU-install CD image will automatically appear on your desktop. It will also pop-up the folder on the image that contains the installer for Sprint’s connection manager, SmartView. Double-click the file called ‘Install Sprint SmartView.mpkg‘ and proceed with the normal Mac installation process. This will require a restart. After you’ve restarted your Mac, you’ll notice that there is a new shortcut on your desktop for the Sprint SmartView software that controls the Sierra 597 USB device. The program displays the status of your wireless card. In this example, it’s ‘Ready: Sprint Mobile Boradband’. If this is a brand new wireless aircard, you’ll need to activate it. You can activate using the steps outlined on Sprint’s support website, or you can let the SmartView software do it for you. Some have reported failures during the automatic activation process, but it was seamless for me. 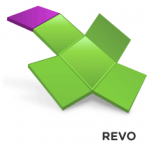 Go to the Tools menu and select Activate Device. You may want to disable Airport or disconnect from your local network. If you can’t connect without it, then go ahead and re-enable your local network. Once you’ve installed and activated, the software (and support representatives) will have you thinking that all you have to do now is hit ‘Connect’. Lies. While this step is necessary, it’s only 50% of what you need to do. When you hit connect, it will probably prompt you for your Mac’s admin password and then just sit there. Lame. What you need to do is configure this new network device in your OS X system preferences. 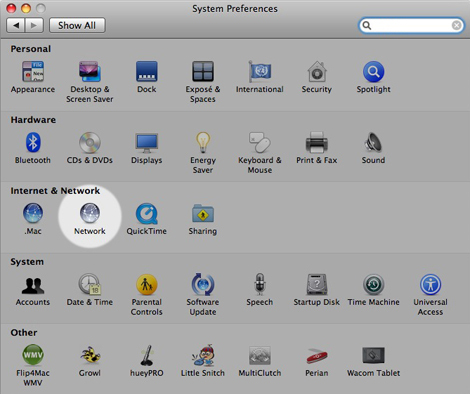 Launch System Preferences and navigate to Network. Your system will alert you that a new network has been found. Hit Apply. 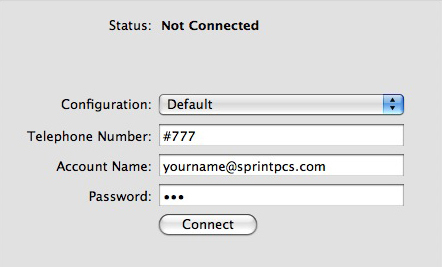 Click the Advanced button near the bottom and, under the Modem tab, choose Sprint as your vendor. The only model available is PCS Vision. So select that and OK it. Check the box to ‘Show modem status in menu bar’ if you choose. Now you can connect using the icon in your menu bar every time you need to use your wireless card. You MUST leave the SmartView software installed on your computer in order to connect. Your system preferences alone won’t be enough. You can, however, remove the Sprint icons from the menu bar and the desktop without hurting anything. 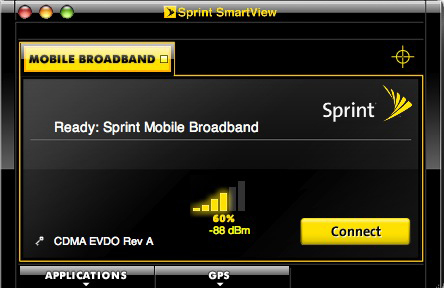 … and Sprint EVDO is most often faster than even iPhone 3G speeds! Yes, I agree that it’s bloatware. Of course, I tried uninstalling it since I had manually configured it. But then I couldn’t connect. Even if it DID work properly out of the box, I don’t see why it’s necessary to have a software installed in order to use the device since I can do it in my system as an alternative. And, Wow! that Cradlepoint looks really awesome! Thank you. Following these instructions, I have been able to do in 2 minutes what Sprint couldn’t do in 2 hours. Worked great. Thanks for the reference on how to get it running on the mac. The weird part is that it worked fine on my macbook running leopard but then I bought a new macbook last month and i had to configure it the way you described below. Why do you think that is? Aaron. You’re the man. This post saved my life. Lol. Oh this one’s a godsend. I can finally get back online once I bought my new machine. Thanks a ton. Thank you! You saved me a lot of time and frustration! Thanks!!! 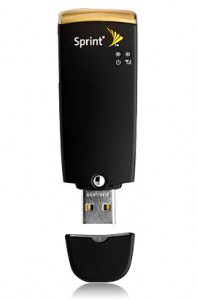 your article help me to configure my Sapido router with my compass 597 to share the internet directly from the USB broadband card. I spent 2 hours in chat with Sprint tech support with no success.